With a PC version of Halo: The Master Chief Collection now officially confirmed, 343 Industries, the developers, held an ‘Ask Me Anything’ (AMA) session to answer questions from the community. One of the biggest revelations from the Reddit AMA is that Halo: The Master Chief Collection on PC could support mods in the near future, though the feature won’t be available at launch. Mods are popular features of games, especially on PC, as it allows the community to modify the game – for example adding weapons or new levels, or even creating whole new games. Modding can prolong the life of games as players come up with ever more inventive mods, and including official support would make it easier for fans to create and add their mods to the game, while giving 343 Industries control over what sort of mods are available. Another interesting nugget of information from the AMA revealed that Halo: The Master Chief Collection won’t be a Windows 10 exclusive, but will also support players on Windows 7. This is an interesting (but welcome) choice, as Microsoft is trying to shift people from Windows 7 due to its upcoming End of Life. The company is also apparently looking at Windows 8 support as well. However, it was also revealed that cross-play support with the Xbox One won’t be there at launch. This will disappoint any PC gamers who were hoping to show console players how much better keyboard and mouse controls are for Halo. 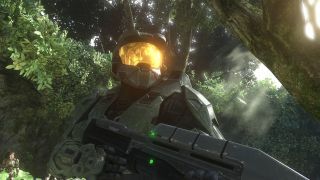 It’s also been revealed that 343 Industries will allow Field of View (FOV) sliders and unlocked frame rates in all games in the Halo: The Master Chief Collection, while a wide range of aspect ratios, such as ultra-wide 21:9, will also be included. There is a bit of bad news as well, as there are currently no plans to port Halo 5 to PC. However, as the PC version of Halo: The Master Chief Collection shows, Microsoft is no longer averse to having its flagship games series back on PC.